Well, here in central Illinois we just wrapped up receiving many inches of rain in just a few days. I know some of you would love to have a bit of it and believe me if there was a way I'd certainly share. Having to run a secondary utility pump because so much water was coming in that the regular one could not pump fast enough. A sensor to detect the water level in the sump well being above a certain level and the pump not running. The amount of time the pump has run in the past hour. Actually, the amount of water that has been discharged would be cool but that might really complicate the system. I don't want the monitoring/measuring to decrease reliability. An audible/visual alert in the main living space if there are problems. A system to send me a text message if there are problems for when I'm not at home. I'll be giving more thought to this. Other important household things are in the same vicinity as the sump so I may give some thought to anything I may want to watch over in terms of the furnace, etc. as well. All this looks like a job for one of those Arduino boards I've been tinkering with. 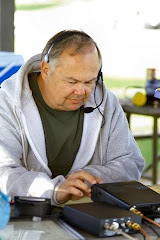 This past Saturday there was another successful "No Host Ham Radio Breakfast" here in Springfield, Illinois. We had good attendance with I believe about 51 people from quite a few of the surrounding counties. I highly recommend that people do something similar wherever you live. Essentially I just pick a date and then start talking it up on the area radio nets, sending emails, etc. On the chosen date we meet at a buffet style restaurant for breakfast and spend a couple of hours catching up with old friends and meeting new ones. The only "official" activity aside from eating is a chance for everyone to introduce themselves and mention any local activities coming up with their organizations. I think the "no host" format is important to the success. By that I mean that there is no club or organization sponsoring the get together. It always seems like there are people who don't like the local club, don't like the nearby club, don't like the ARES group, etc. Yet somehow if there's no organization involved they're able to come eat and have fun. People. Go figure. Looks like the FCC is going to write some rules regarding net neutrality so that broadband providers won't be allowed to provide priority of their own services like telephone, etc. over those of competitors. This NPR story has more information. I guess I have mixed emotions. On one hand if it's my "pipe" I think I ought to have some rights to provide the best service/speed with my own products. On the other hand I see the desire to make things "even" because in a lot of places consumers may only have one or two options for broadband Internet. Okay, I think I'm officially an Arduino fan. At least for one of a kind projects. The board I recently purchased worked flawlessly. Beyond that a little web searching reveals all sorts of useful add-on hardware that is fairly reasonably priced. There are a host of accessory boards, or shields in Arduino-speak that make your life easier and your project easier. Some of the available shields include plain prototyping shields, ethernet shields, WiFi shields, ZigBee shields, motor controller shields, and on and on.